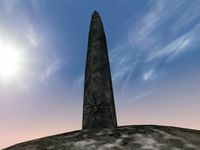 The Sun Stone is located in the southeastern portion of Solstheim. If you follow the Iggnir River south until it bends towards to the east, and then head uphill towards the northeast, the Sun Stone is on the top of a large snowy hill. The Sun Stone is one of the six All-Maker Stones sacred to the Skaal and is involved in The Ritual of the Sun. There is a small chance that an Insane Wanderer—a female level 65 Nord barbarian—spawns east of the Sun Stone. She is located close to the shore, on the grass between two patches of flat stone ground. The Insane Wanderer turns into a werewolf between 9pm and 6am. This page was last modified on 27 February 2014, at 01:38.